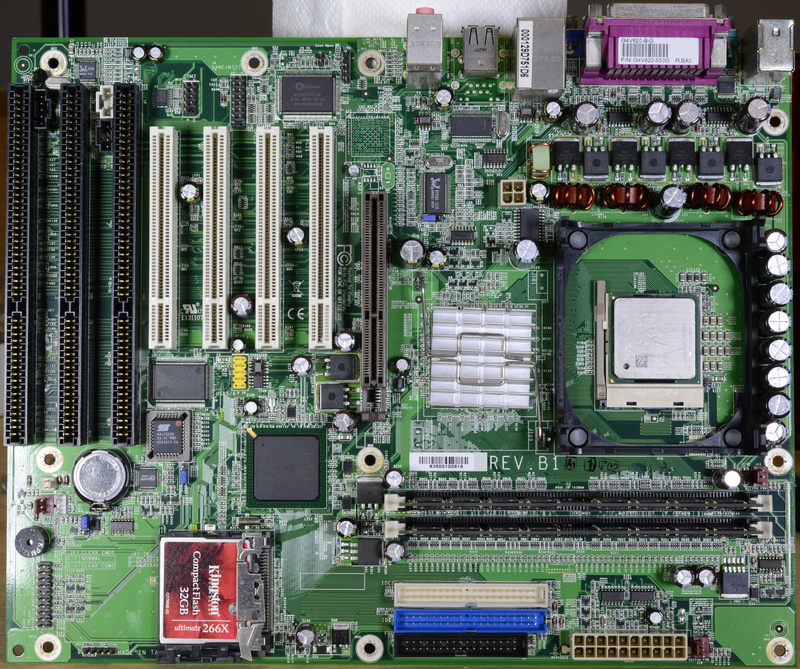 January 2016 — The DFI G4V620-B-G industrial motherboard has the Intel 845GV chipset and supports 533 MT/s FSB. 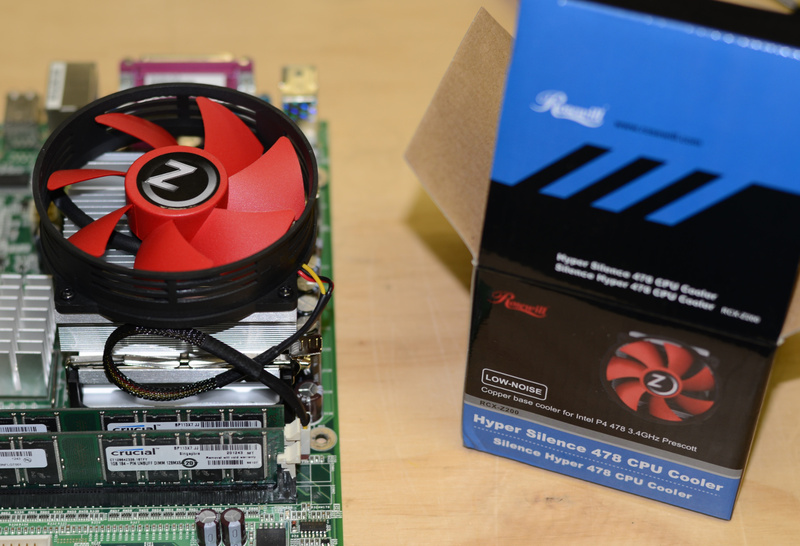 It was going to be the basis for my most ridiculously overpowered DOS gaming PC, but the build was a disappointment for two reasons. 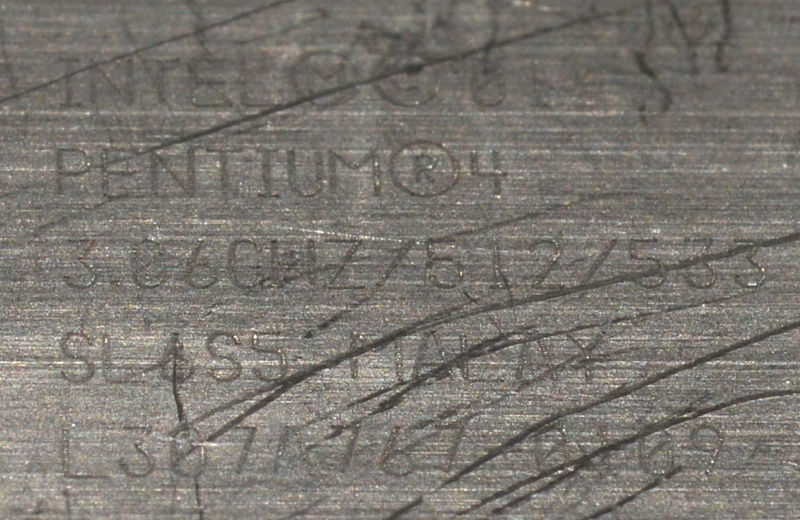 First, the AGP slot proved to be unusable. Second, the sound card did not work right in Duke Nukem 3D. The CF card was a waste. There is no DMA to that card slot. 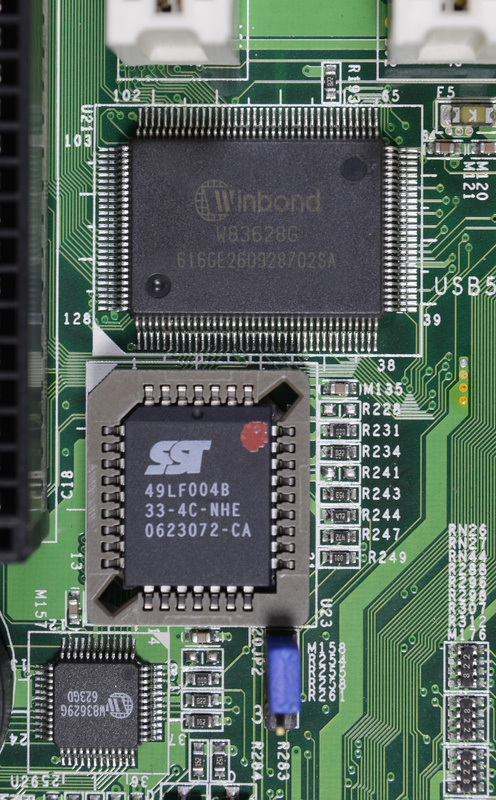 PCI-to-ISA bridging is done by Winbond W83628G and W83629G chips. Hopefully, the W83627G LPC I/O chip isn't involved; it would have to be if PC/PCI DMA were not available. The highest supported CPU is the 3.06GHz Northwood P4 (the only one in the Northwood HT series that was 533 MT/s instead of 800 MT/s). I obtained a barely identifiable one through EBay, S-Spec SL6S5. 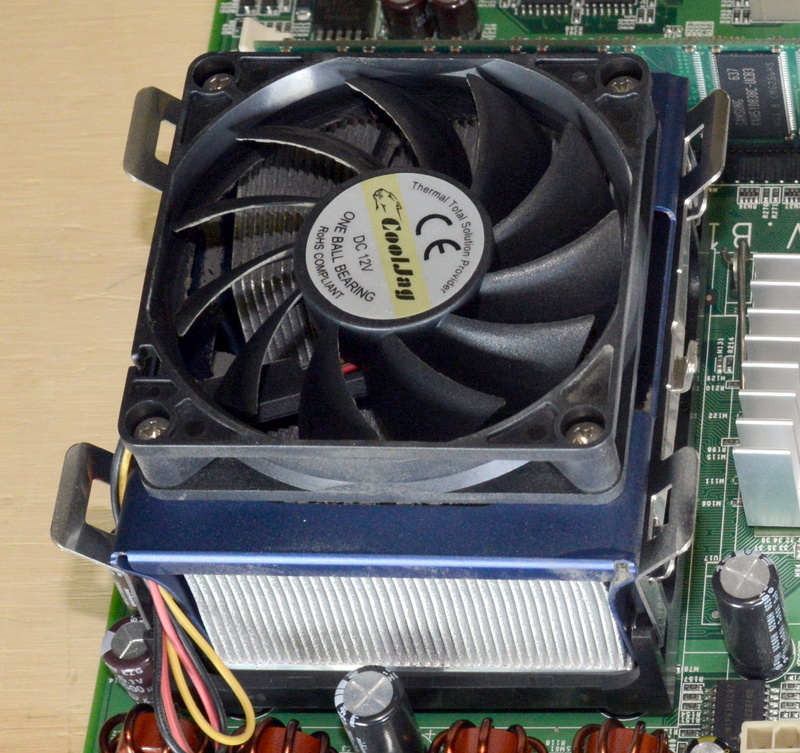 The "CoolJag" CPU cooler that came with the board was relatively good, but the fan rattled a lot. I replaced it with Newegg's Socket 478 cooler, which is quiet and effective. With matched Crucial/Micron PC2700U DDR-333 CL2.5 1 GiB DIMMs, it booted and tested OK. I chose the GUS Classic. For DOOM, the sound basically worked, though sound effects were slightly glitchy in a way similar to what happens with legacy audio drivers for some PCI cards. For DN3D, sound effects only came through the right channel. They worked fine in the sound effects test in setup, but in the game they were broken. I don't know why this happened or how to fix it except by switching to a different sound card. The GUS sound driver of DN3D seems to be exceptionally fragile. The integrated AGP graphics worked smoothly in DOOM, albeit with analog VGA only. DN3D was limited to the maximum resolution VBE mode of 1280×1024, at which it managed only 17 fps. 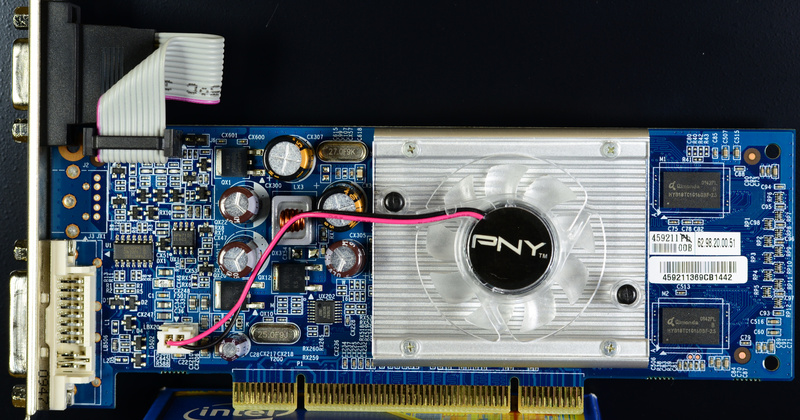 A proper AGP card might have helped, but no AGP card would work. Apparently, the big difference between 845G and 845GV that warrants the "V for value" designation is that the AGP slot doesn't work with normal graphics cards. DFI's manual stated "1 AGP slot that supports ADD (AGP Digital Display) card only." ADD cards just provide a DVI output for the i845 integrated graphics; they have no on-board memory or GPU. Thus the choice was whether to stick with integrated graphics that compete with the CPU for memory bandwidth and have lousy Linux drivers or to install a PCI graphics card that would compete with the sound card for PCI bandwidth. 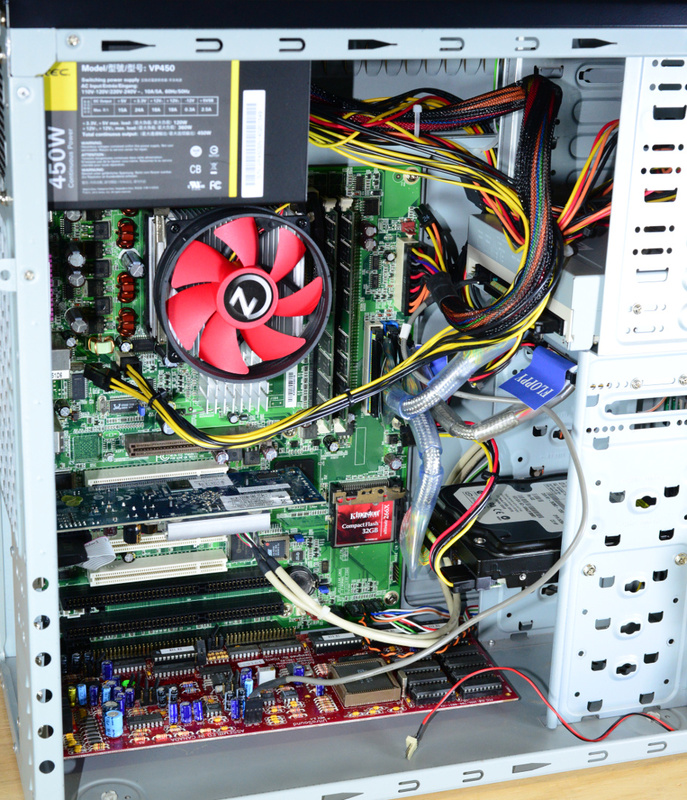 It was far from obvious which would be better, so I got a decent PCI card and gave it a shot. In Linux, with the new card and Nvidia drivers version 340.96, PrBoom-Plus ran smoothly, but that was the only good news. EDuke32 (Polymost) would load textures, start up successfully, and run for a few seconds, then a hard lockup would occur. In DOS, the DN3D framerate at 1280×1024 dropped from 17 fps to 7 fps! 1600×1200 mode was available but useless at 5 fps. DOOM still ran mostly at its maximum frame rate, but it seemed a bit less smooth. 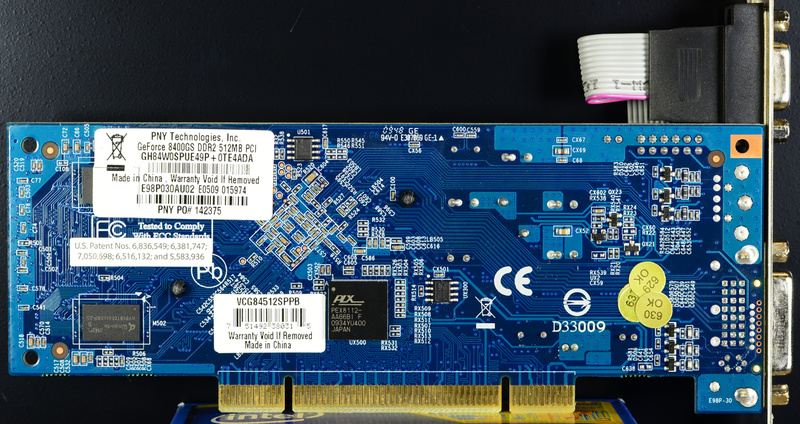 Verdict: integrated AGP beats discrete PCI. For now, this PC is good for DOOMing, but the PCI card is coming out and eventually the GUS will move to a PC where it works with DN3D.